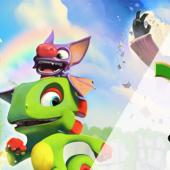 Fancy wining a copy of the highly anticipated platformer - Yooka Laylee, made by the company who made childhood classic Banjo Kazooie. We’ve got one copy to give away on either Xbox One or PlayStation 4, plus 5 exclusive art cards. To enter our competition, you need to LIKE, SHARE the competition on our Twitter and Facebook page as well as FOLLOWING it. Competition will run until the 28/4/2017, Winner will be picked randomly.